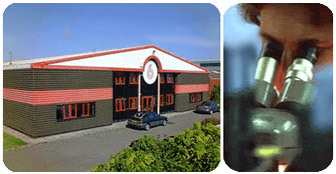 Dowson Blades is a privately owned company, established in 1987, situated on the fringe of the English Lake District. All blades are manufactured at the Workington site utilising a precision surgical grade steel. Due to the unique high volume production process, top quality blades are available at the lowest prices. Dowson Blades is believed to be the only manufacturer of bread slicer blades in Europe which conforms to the stringent quality requirements of BS EN ISO 9002, and have been accredited by the British Standard Institute since 1991. Developments which have taken place in the Plant Bakery Sector have necessitated an advanced blade geometry capable of longer slicing with improved slice quality. These developments are now available to the Craft Shop baker. Dowson Blades provides a specific edge geometry to enable high quality slicing with improved blade life. In order to remain Europe's largest manufacturer of reciprocating bread slicer blades the ongoing development of material and geometry has resulted in the high street baker having access to the technical improvements obtained in plant bakeries. Since 1987 Dowson Blades has manufactured quality slicer blades for the bread production industry. Our specially hardened, tempered and polished surgical steel provides the longest lasting edge life compared to our competitors in the industry. All blades are supplied "ready to fit" complete with the appropriate pins, rivets, toggles or holders to enable ease of fitting into all the common reciprocating bread slicing machines. One-off specials can also be produced to sample or customer drawing. Dowson Blades has grown and progressed on a reputation of consistent high quality which has been achieved through the use of purpose-built precision grinding machines, designed by our in-house design facility and built by our engineers. The production of blades with exact specifications for pitch, width, thickness of material and edge geometry are the result. We carry a vast range of stock covering all common bread slicer machines, enabling orders to be despatched on the same/next day. If you require a blade which is not listed please contact us for a quote.